What is Minutes of Meeting? The Minutes of Meeting (MoM) is a written report, which summarizes a meeting or hearing. The MoM records the tasks, decisions, attendees and any other vital information that was conveyed during the meeting/hearing. It is not a transcript of the meeting and doesn’t record all of what was said during it. The MoM is typically dictated by the meetings’ chair during the meeting itself and distributed by them to all stakeholders and team members. People forget what they say and that is the most important reason why minutes are needed. Minutes is an important followup document with all the details about the meeting including agenda, where the meeting was conducted and who attended the meeting. A mechanism of sharing information about the meeting with people who did not attend the meeting. 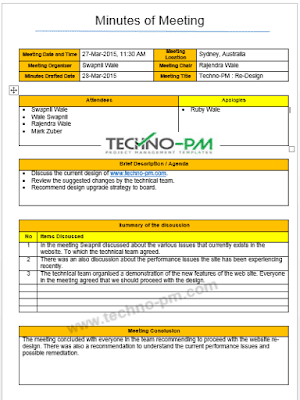 Having a standard document or meeting minutes template will ensure all the meetings are documented in the same fashion. Document key points that were discussed in the meeting. After publishing the minutes if everybody accepts the minutes then there will be no conflicts. It is important to capture what everyone's view is about a given topic. Document action items which help in following up on tasks with a due date. Document decisions made in the meeting and also who made the decision. Can be used as a starting point for new meetings. Following the steps outlined below will result in a comprehensive MoM, which can be used as a tracking tool in the hands of the stakeholders. The chair designates a recorder of the meeting, and it’s their sole responsibility to produce a MoM report. The recording should be done during the meeting, and not rely on memory. While the attendees arrive (or call in), the recorder should add them to the attendee's section of the MoM. Also, the date, meeting chair, and any other relevant details should be recorded in the MoM. Each row should be numbered for reference sake. The type of row needs to be outlined, where the type is typically either a task or a decision. The difference is that a task is a one-time effort which has a due date for completion, and a decision affects the entire team/project/company, from the date it was published onwards. For example, A task can be “Danny needs to bring a cake to office by the 19th of July 2017”, and a decision can be “All team members must wear a red hat when presenting at a conference”. The task/decision needs to be simply explained so that even someone who hasn’t participated in the meeting can understand what they need to do. The due date of when it is expected that the task will be done. If the row contains a decision, the due date is when the decision was made (which is usually the date of the meeting). The owner of the task needs to appear so that they can resume responsibility over it. If the row contains a decision then the owner is whoever made it. The status of the task gives a brief summary of where it stands. This is usually a drop-down list which contains a few possibilities. The list typically contains the following attributes: “Completed”, “In Process”, “Not Started” and “Cancelled”. It is acceptable to add a few more attributes, such as “On Hold”, “Postponed” etc. A decision shouldn’t have any status. The last column allows the task owners to write any remark they see fit, while the rule of thumb is the more the merrier. If it a decision, whoever made it can explain the reasons and logic behind it. A task should have only one owner, in order to avoid confusion regarding who is responsible for performing it. If there is an SME (Subject Matter Expert) that should be consulted, their name should be mentioned in the remarks column. Presenting the MoM report during the meeting will allow all of the attendees (and especially the chair) to approve its content online. This will help in diminishing objections to it. The row type may be expanded from only “task” or “decision” to include different variants of tasks: “Risk”, “Opportunity”, etc. If an attendee joined the meeting via VC (video conference) or teleconference, this fact should be recorded next to their name in the attendee's list of the MoM. The MoM should be distributed by the meetings’ chair or whoever recorded it. This will give the task owners an address of who can update the status or remarks of the MoM for the next meeting. The first section of each meeting should be reviewing the tasks of the last MoM and updating their status/remarks. Once a task is completed, it can be removed from the MoM. All the MoM’s should be stored in a public folder which can be accessed by all (read-only access). Keep taking notes in the meeting however small the detail is even if you are the organizer. It is easy to forget. After the meeting is complete you can skim through your notes. You can document the minutes only for the key information. Always document the minutes immediately after the meeting so that you do not forget what was discussed. Documenting when it is fresh in your mind is very easy and you will be able to recollect any key points discussed easily. 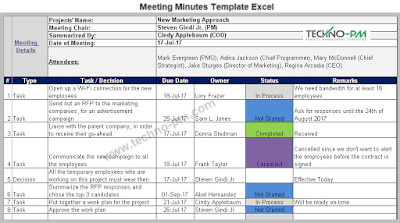 Make sure that the MOM is circulated much before the meeting so that the people can get a chance to read the template. Whenever starting a new meeting always review the minutes from the previous meeting. Whenever putting something controversial or recording a decision make sure you check with the person who will the owner. Documenting minutes is very crucial in project management. Without proper documentation, a project manager will always struggle to hold people accountable for what was said and what was done. 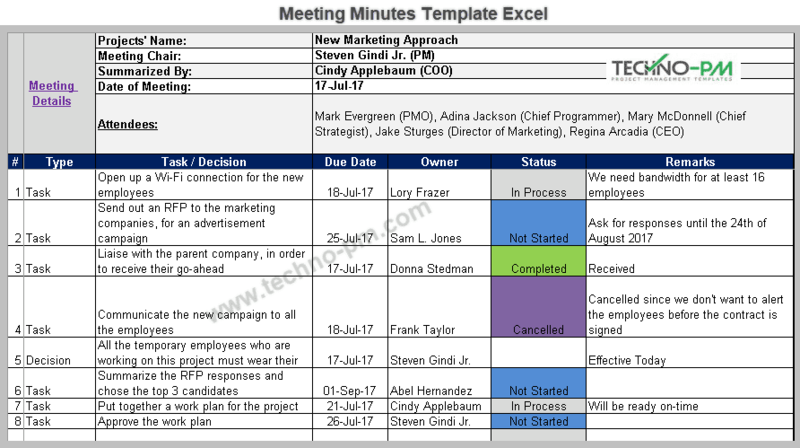 Make sure you use the right meeting minutes template excel so that all the information is captured. Having a proper MOM format to the minutes will make sure people will read the minutes. Remind people of the action items in the template so that they do the necessary task. Keep all the previous version of the document so that you can have a track of the historical information. 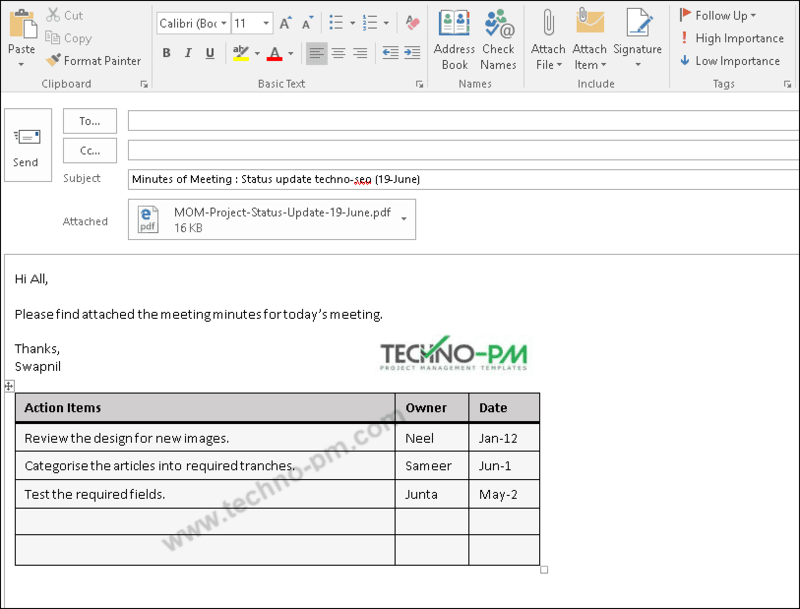 How to send email for minutes of meeting? Include both the people who attended and missed the meeting. Send the minutes ASAP after the meeting. It is also a good practice to copy the action item in the email so that people who are responsible will know without opening the attachment. 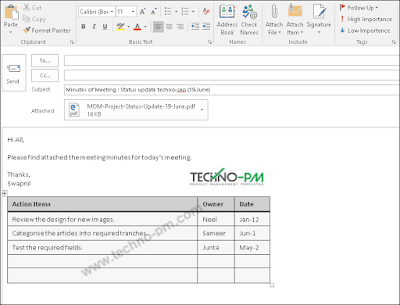 Include the meeting title, date and time in subject and attachment name so that you can easily identify the email or document a later point in time. Don't forget to attach the minutes with your email. To reduce the size of the attachment it is a good practice to convert the document to a PD.